IndyBikehiker: "MAY I WASH YOUR FEET?" "MAY I WASH YOUR FEET?" Jesus set the example of servant leadership. Do we resist? Let you be my servant, too. HOMELESS NEIGHBORS' FEET. 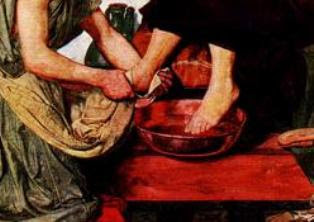 The radical humiliation of washing the feet of another person first struck me when I was asked to help a nurse with foot soaks and foot massages for the homeless men who visited Horizon House. I initially offered to help, but when the hour came, I found myself strangely resistant and made excuses not to be available to wash their feet. The next week, the nurse wouldn't let me off the hook. I found myself kneeling before the dirty, swollen, smelly feet of a homeless man. Still resistant but yielded, I gave myself to the task, pushing thoughts and inner protests aside. One after another, I washed and massaged feet until there were no more feet to wash. I felt relieved and released and somehow strangely at peace. From that point on, I have always viewed people without homes as neighbors, recognizing and accepting my connection, complicity, and challenge in their condition. LEADING PARADIGM. During my 2000-mile bicycle ride through India in 2007, we were honored in Bangalore by foot washing. The Free Methodist Bishops of India knelt down and washed each cyclist's feet in front of all their pastors, parishioners, and non-christian friends and community members who gathered to welcome us to that city. Knowing the strong sense of caste and social role that pervade the various Indian cultures, I can only begin to imagine the radical--even offensive--action of a leader washing anyone's feet. But this is likely close to the context of Jesus' action on Maundy Thursday. He is the Servant Leader and this is the primary image for Christian leadership. The towel and basin stand alongside the cross. Those who dismiss or stray from this paradigm mislead.